COVRI Password Change web part for Microsoft® SharePoint® 2010 allows end users to change their own Local NT or Active Directory password with in SharePoint environment without administrator intervention complying with the company’s Password policies. It also notifies end users when their password is about to expire. Change Active Directory or Local NT passwords without administrator intervention. Warns the end users if password does not meet company security requirement policies. Password strength indicator. Inform users about password expiry. Password Change activities stored in administrator’s log. Click on the Insert tab under Editing Tools, and then click Web Part. 1. Users can access the password change page by clicking Password Change from the main dropdown menu of the current site or change the password directly from within the Password Change Web Part. 2. On the Password Change page, or from within the Web Part, enter the current password, new password, and confirm the new password. 3. After the password has been changed successfully, user will be notified through a message. 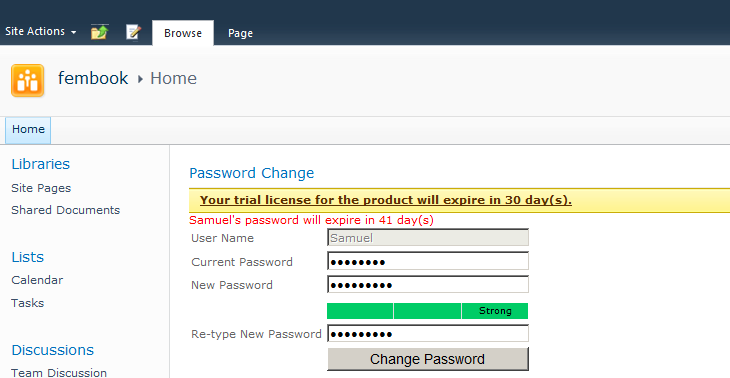 Password Change Web Part Version 1.0 released on 31st December 2012.